After a false start three weeks ago, the day has arrived when I’m off to Portsmouth on the first leg of my journey down to Malaga for a four month stay. The car and van is already loaded and all that’s left to do is mover the caravan from its parking spot and hitch on. 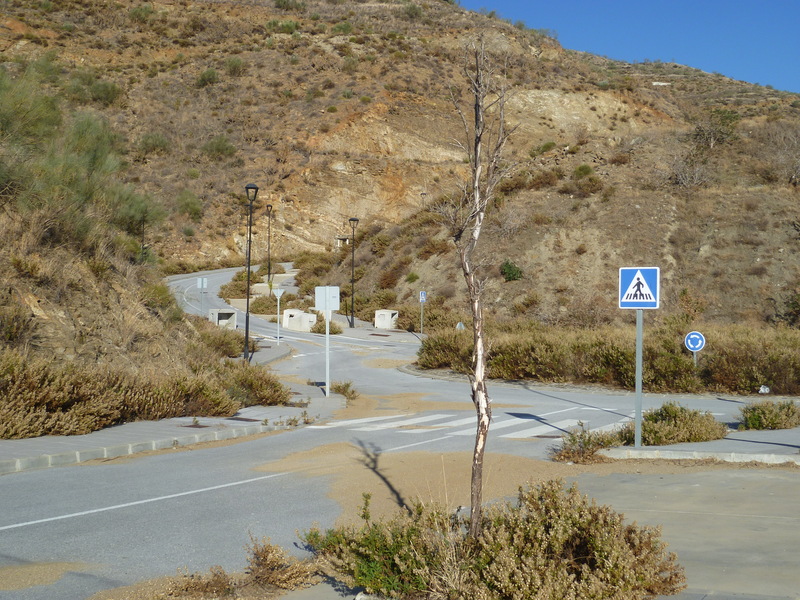 I’m heading for El Pino at Torrox, in Malaga Province where I’ve stayed on and off for several years. Hopefully the sweetheart of a receptionist will have kept me the same pitch as I had last year. This trip will be my nineteenth winter spent in Spain, although the early ones were only of six week duration. My journey plan has me arriving in Santander Port around 6pm on Saturday evening. I’m driving the ten or so miles to Virgen del Mar to spend the night. Then it’s an early start to drive the 300 miles to Aranhuez, Another 300 the next day should get me to Torrox by teatime on Monday. Mid morning on Friday had me thinking that I was well ahead with my leaving preparations but last minute jobs took longer than expected However in spite of the later than planned departure, the 70 mile drive down to Portsmouth went well and in sunshine. Although I arrived several hours before departure time, the checked in lines were already quite full with motorvans and caravans. One of the Brittany Ferries guys drew my attention to a bar hanging down beneath my van. I discovered I’d lost one section of my mover cross-over bar. I thought it best to remove the remainder. Maybe a repair job for after I arrive at my destination. Cap Finistere was about half an hour late leaving the dock, and standing, looking out from the upper deck I was amazed at how late some travellers arrive for their sailing. After all, miss this sailing and the next one is in two or three days time. Once into mid channel the sea became quite rough but sitting around on board the motion wasn’t too noticeable only when walking about. After a reasonable night’s sleep, this morning we have a cloudy but bright sky and the GPS screens show that we are in mid Biscay, travelling at 25knotts and scheduled to arrive in Santander a little before time this evening. Cap Finistere got into Santander 20 minutes early on Saturday night but by the time we unloaded it was 6pm. But in my case there was no hurry since I was only driving the ten miles to Camping Virgen del Mar. Much to my amazement I was the only caravanner there. Considering there were dozens of vans and motorvans on board, I couldn’t help but wonder what their travel plans were. But I was happy to get the legs down and after a relaxing evening – an early night. I was ready to leave at 8am next day. Eight miles into the journey got me to the first filling station and I was ready for a full tank. 1.35E per litre. As the road climbed, so did the weather worsen. Before long the wipers were briskly moving across the screen By the time I reached Burgos the rain had stopped and there was some sunshine – but not for long. Lunchtime got me to my favourite stop at a filling station at KM150. After lunch there was time for a 1/2hr siesta. On my way again and in 40 miles there was the long drag up the Puerto Sommosierra. Thankfully the roads were clear of snow but the evidence of recent falls were still by the roadsides. My next cuppa stop was a filling station just before the turn for the M50 round Madrid, but big surprise – the place was packed with lorries. Of course – I should have realised – they’re banned from the roads on Sunday. I had no alternative but to continue. The Madrid motorways were just as busy as any weekday but I reached the A4 without any difficulties. Just before my night halt I stopped for another fillup. Twenty minutes later brought me to the campsite at Aranhuez. Seven or eight vans and motorvans had booked in before me. Again I pitched up on a deep pitch which allowed me to stay hitched to the car. No sooner had I plugged in the electric and the rain started. It was still hammering on the roof as I went to sleep. 8am and I was ready to move and the rain had stopped. Aranhuez is always a busy town for traffic and it’s a slow drive out to the motorway. Within 1/2hr of leaving, I was climbing a fairly steep hill. Suddenly the engine management light shone brightly from the dash, accompanied by antipollution warnings from the display. The engine was obviously in limp mode, since I had to get down to 1st gear to keep moving. Fortunately I was able to pull into a slip road to investigate. My initial thought was to try a BSI reset by disconnecting the battery. That didn’t work. Thankfully I’d decided to pack my Autel Diagnostic meter. I connected it to the OBD socket and found two codes recorded. I choose to delete them and fearfully tried the starter motor. The engine started and to my relief, the EML wasn’t lit. I carefully pulled away and everything seemed to be back to normal. I continued on my journey with growing confidence. The next 270 to Torrox were accomplished without further trouble. I can’t help but wonder about the quality of last night’s fuel fill. 2 degrees when I left this morning. 18 degrees when I arrived. I arrived here at El Pino at about 3pm to find my favourite receptionist had kept me the pitch I’d asked for. (They have a policy of no advanced bookings) After such a hectic day it was sufficient to get electric and water plugged in. Then a chair parked outside with a long awaited cuppa. Tomorrow will be time enough to think about the awning. After all, there’s another sixteen weeks here. What a great feeling it was to wake up this morning knowing that I didn’t have to wind up legs, spool in the electric cable and get into the car ready for another day’s driving. Instead a leisurely breakfast taken whilst I watched through the van’s front windows the rising sun . I had nothing planned for today other than erecting the awning and finding a home for a car full of gear. By ten oclock, with Aquaroll filled and sink water tipped, I was ready to make a start. Twenty minutes into the job, and help arrived. William who I’ve known for a few years and who arrived here a week ago came to offer his assistance. Getting the awning ship-shape and groundsheet down took up most of the morning. After the strenuous morning, today’s siesta was rather longer than usual, and after setting up my cooking equipment in the awning, I settled myself in a sunlounger ready for an afternoon of chatting. Here at El Pino there is a variety of residents. Many are caravanners owning either touring vans or motorvans. UK caravanners are probably outnumbered by Dutch and German, plus a few from Norway and Sweden. A few of the British contingent leave their vans here all the year round. They pay a ‘parking fee’ and the daily rate when they occupy their vans. Other Brit residents live here full time in permanent wooden chalets, although a few still have their homes in the UK and visit them during July and August. It was with some of these old friends that I spent a pleasant afternoon chatting and catching up on events since we parted company last March. The priority for tomorrow is to visit one of several local supermarkets to stock up on daily neccessities. And after that, to ponder on why my Truma water heater won’t work on electric. It was fine when I used the van in late September. Now it only works on gas. It’s more than a week now since I arrived Spain, and already I’ve fallen into an easy daily routine of first seeing to the domestic chores followed by a leisurely few hours of sitting in the awning watching the world go by. It’s been a real pleasure meeting up with friends from past years and catching up with their news. The site provides a free wifi connection close to the reception area, which fortunately I’m able to connect to from my pitch, so it’s convenient to send emails and visit forums. In the afternoons I usually take a bike ride – often down to the lighthouse, then along the prom. By the time I’m back at the site, I’ve covered around five miles. Being Sunday today , it’s also been one of those days with a fairly cloudless sky and very little wind, so the local Spaniards were out in force keeping the bars and restaurants along the prom very busy. And others, with their sun loungers and parasols were stretched out on the beach. Even one brave soul had ventured into the water. But not every day has been like today. When I arrived here, campers who arrived a few weeks earlier were all complaining about how cold it had become. 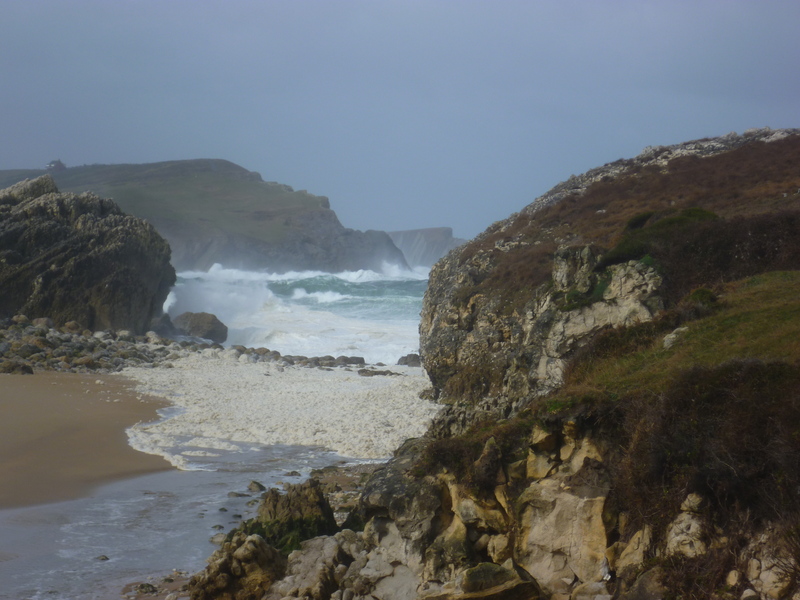 For someone who had just left the UK’s weather behind and had experienced the low temperatures when travelling through northern Spain, I was delighted with the weather I had arrived to. Since getting here the weather has been mixed. Some days have been cloudless with temperatures pushing 22C whilst other days have had more cloud and sometimes with a keen wind, but even then the temperature has been around 16C. Overnight temperatures haven’t been less than 8 or 9C. Oh yes! And it rained once – for about five minutes late one night. My Truma water heater is still refusing to spring into life on the electric, and investigation with the meter is indicating that the element has indeed burnt out. A supplier who will ship to Spain has already dispatched one, so that should be here before the end of the week. Then a fun time is on the cards getting the elements swapped over. I’ve had a mixed bag of weather since that glorious day last Sunday. Monday was still good so I took the opportunity to do my laundry. 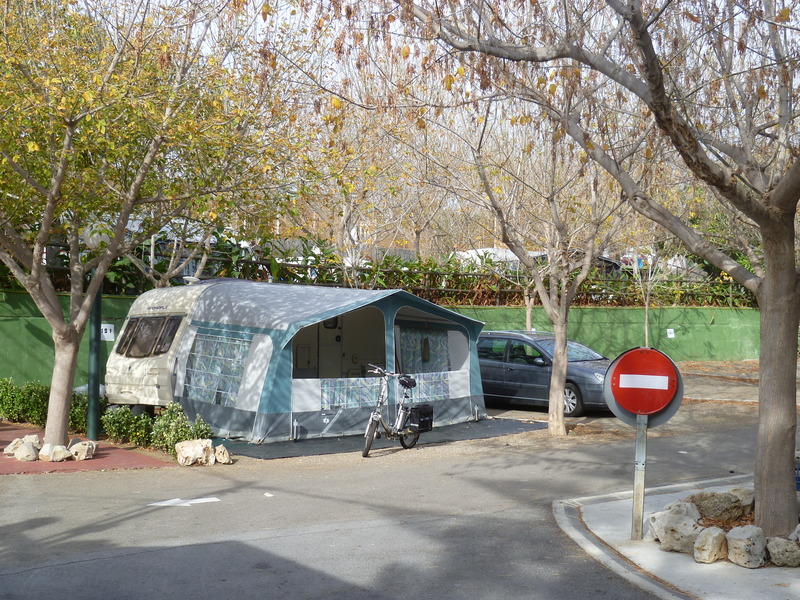 For many years when I travelled to Spain I carried my own washing machine with me, but when I made that impetuous decision three years ago to sell my caravan and all the equipment, the washing machine went with it. I just haven’t bothered getting another. Instead I use the site’s washing machine. I had the laundry out on the line by 9.30 and at lunchtime, it was ready to bring in. My afternoon bike ride down to the prom was to be the last one for the week, for the weather rapidly went down hill, with cloudy skies and a cold easterly wind. Fortunately my replacement Truma Ultrastore element arrived on Wednesday. But not at the site. All that was delivered was a notification that it would be available for collection at the local post office between the hours of 08.30 and 14.00hrs. So on Thursday morning the worst weather of the week, I was there early to collect. On my return, a quick cup of coffee and I was ready to start removing seating and centre chest of drawers. Straight away I could see that the boiler was fitted very close to the front wall of the van with the element pointing directly to the fuse panel. With electrical connections removed and water drained, I undid the two 7mm nuts holding the element. By partially withdrawing and then lowering it, the unit came out below the fuse box. The new one went in by the same path. With nuts tightened and the pump switched on, the boiler quickly refilled. It was then that I saw one of the push fittings dripping one which hadn’t been disturbed. No way could I get it to stop, so I went off to see friend, Willy – and he came down to offer his advice. But the dripping wasn’t going to stop, so Willy went off to see another mate and came back with a new connector, which solved the problem. (Aren’t caravanners a great lot of people?) With electrical connections remade, we switched on and waited for some hot water. That night’s shower was a bit longer than usual!! Friday’s weather was a complete turn-around. Right from the start we had a clear sky and sunshine so I planned to take some lunch with me and my bike and drive twenty miles inland to Lake Vinuela. The first six miles is along the costal autopista, before turning inland. At first the road winds along the valley floor, but then for the last few miles there are some steep hills, before reaching another valley. 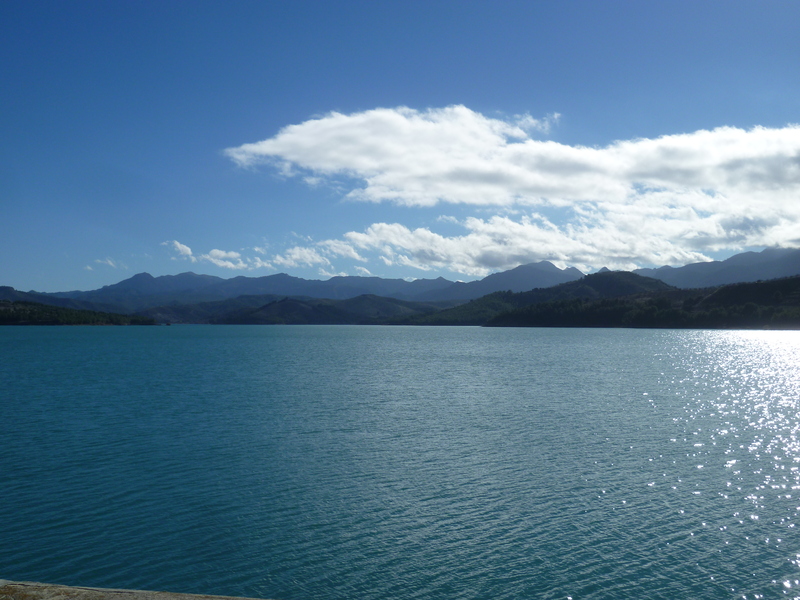 Although the water which stretches for about four miles in length is referred to as a Lake, it is really a reservoir with a dam at one end, and set in an area of wooded park land, laid out with pathways and picnic areas. Several years ago it was possible to park a motorvan in the park and stay for weeks at a time, but with the growing popularity of over-wintering caravanning, so have the restrictions increased. It’s a beautiful spot for bike riding and walking or even just sitting. Looking at my calendar, I realize that I have already been in Spain for two weeks. How time flies! Supermarkets are now well into top gear with their Christmas displays. But it’s strange not to see freezers full of turkeys and the shelves not ladened with a variety of Christmas puds. 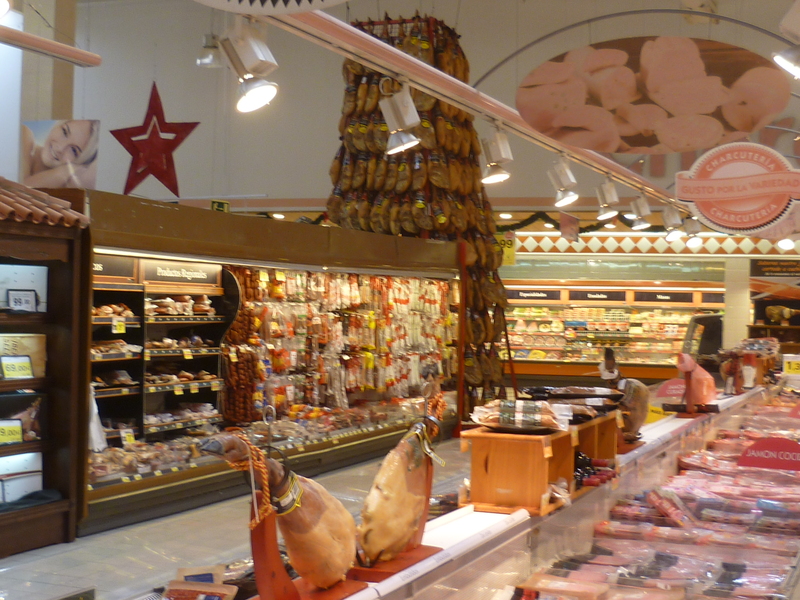 Here the favourite buy is smoked hams because the shops have huge racks full of them varying in price from 40 to well over 100 Euros each. My favourite receptionist tells me that many people have their main Christmas meal after attending mass on Christmas Eve. And although some families exchange presents on Christmas Day, many delay it till the festival of the three kings on the 6th January. The 26th of December is not a holiday, although yesterday and Monday are. Hence the site is rather busier than usual this weekend with local caravanners. 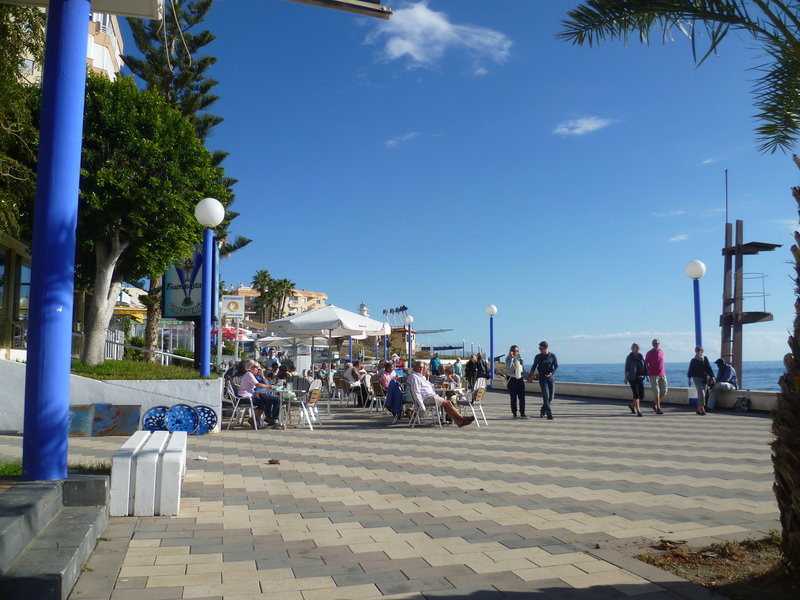 On Wednesday afternoon I drove towards Nerja and parked on Playazo Beach, There I unloaded my bike and cycled along the various proms into the old town. 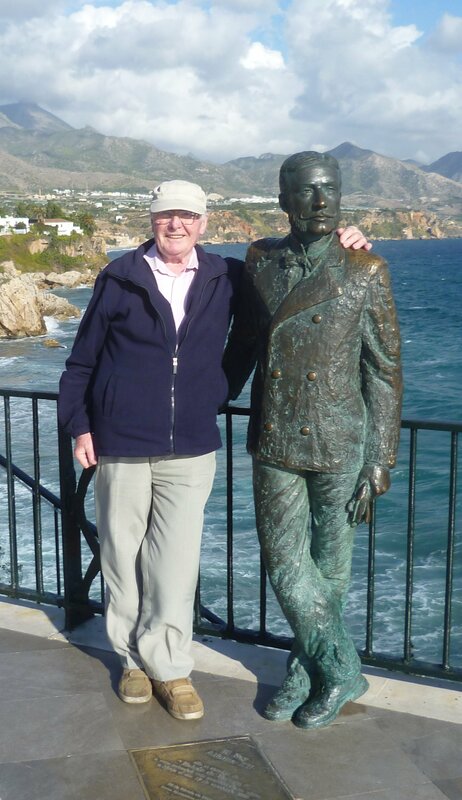 From there, through the narrow, pedestrianized streets, I reached the Balcon, which is Nerja’s main tourist attraction and is built on a promontory between two beaches. My old mate Alfie was still there and after snapping another couples camera for them, I got them to do the same with mine. In the 16th Century many castles and watch towers were built along this coast, and one such castle was built on this high cliff. However in the 18th Century the castle together with another battery close by, were blown up by the British navy to prevent them being used by the French. In 1844 the area was devastated by an earthquake and shortly after, King Alphonso visited the town and suggested the cliff top be laid out as the finest balcon in the whole of Europe. To commemorate his visit, many years later, the bronze statue of him was installed here. On another afternoon I biked into the hills behind the site and along the 1.5 mile road leading to nowhere. Eight years ago the plan was to build a new urbanization. First they built the road complete with lay bys for parking, followed by roundabouts and tiled pavements. Then came the street lighting together with pedestrian crossings and road markings. Even orange trees were planted along the roadsides. And then came the financial crisis. Work stopped. No houses were ever built and now with the orange trees long since dead and the sub-stations vandalized for their copper cables and natural stone cladding, the place stands deserted, a memorial to millions of wasted Euros. What a great week for weather this has been. Each day has been sunny and bright with not too much cloud. Although that’s not to say there’s been no wind. On most days, if tummy didn’t tell you it was time for lunch, the arrival of the breeze would. On some days it’s gradually increased in strength to become particularly strong throughout the afternoon, then falling away as sunset approaches. along the road but Dave & Liz who have been caravanners on level 400 at El Pino for the past three years or so, but for this year, they are trying long term apartment rental. What a small world it is!…………….They think they will be back here next year…………With everyone returned on time, the coach got away by 4pm. Our first stop came only five minutes into the journey. A plane was due to land, and since the runway stretches from sea to sea, the only option is to stop the traffic on the main road; rather like a railway crossing…… but for longer! On the move again, and in another 2000yards, we were at Border Control. Everybody off the coach together with their shopping trolleys and bags and into the customs hall. Much to our surprise we all just walked through – not just our coach party but several others too. 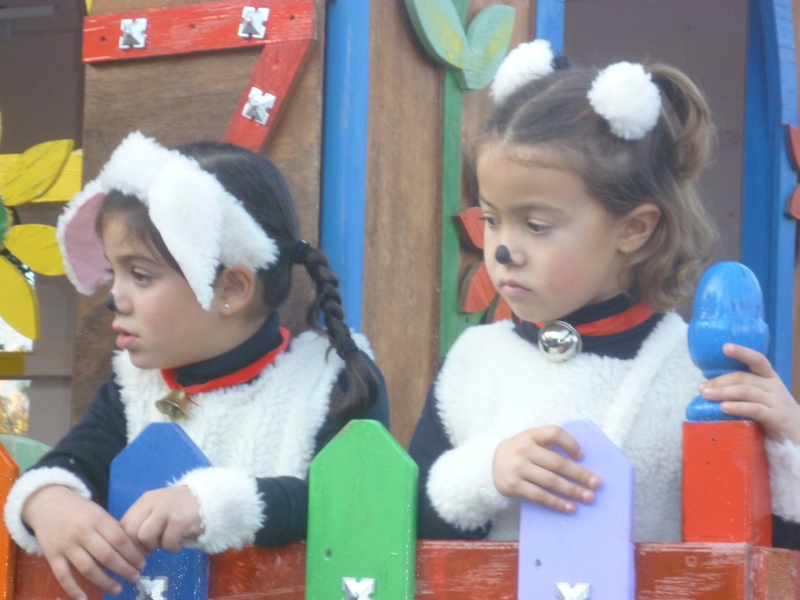 Having “walked into Spain” we waited for our coaches to arrive…… And waited….. Eventually one did appear – but not ours. Coaches it seems are the latest targets in the current dispute between Gibraltar and Madrid. Private cars too continue to be delayed. After such a long day, we were all glad to get back to our vans by 7.30pm. 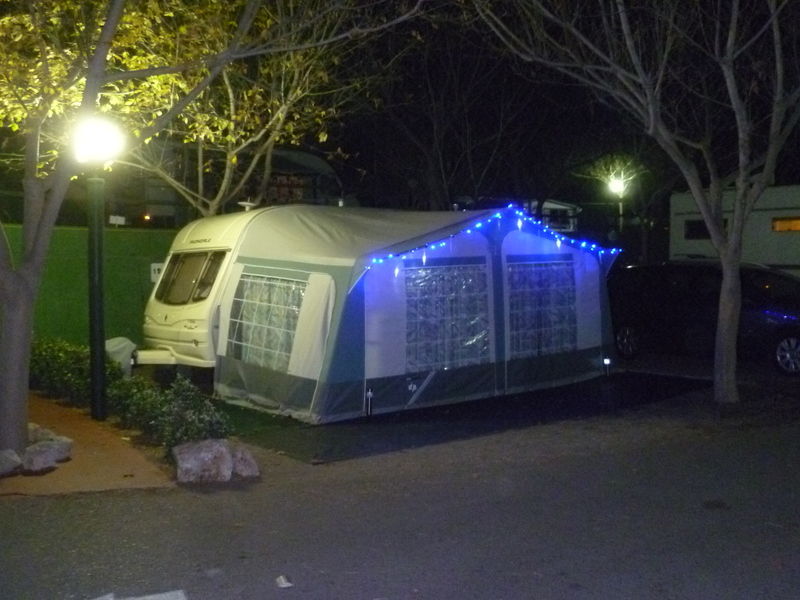 Many of the caravanners who intend to stay here until the New Year have their vans decorated with Christmas lights in anticipation for the arrival of Father Christmas. Every Christmas Eve he tours the site in his horse drawn buggy before going to the El Pino bar where he distributes gifts to the local children. Christmas has been and gone. My youngest daughter likewise.. She has been with me for the Holiday period but today it was time to say a sad farewell at Malaga airport. But the good news is that she may be able to return for a long weekend at the end of January. Unfortunately medical reasons kept my eldest daughter at home over the Christmas period. The tour of the site by Father Christmas which has been enjoyed so much in past years didn’t happen. A change of management at the site’s bar and restaurant brought with it a change of routine. The Father Christmas tour was out and a Childrens Party during the afternoon was in. 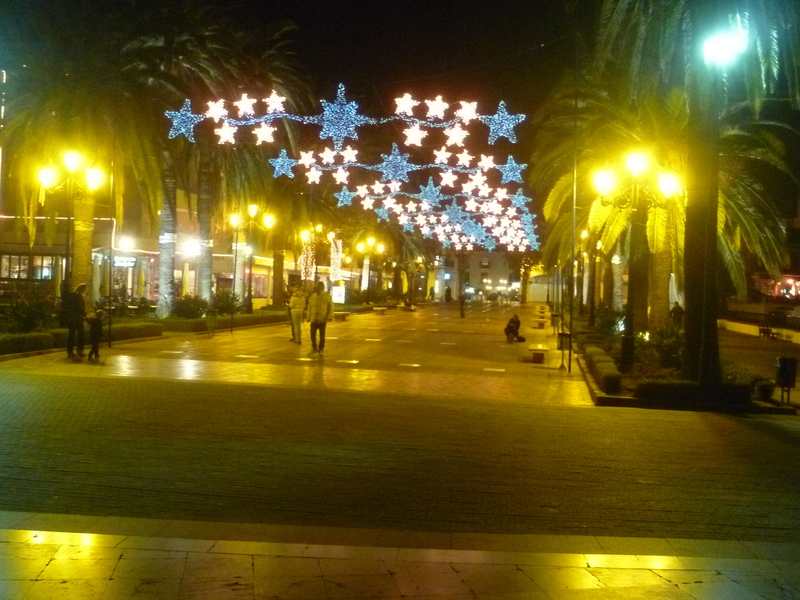 The Balcon at Nerja has its usual wonderful display of Christmas lights. When we went to see them on Christmas Eve, the place was pretty much deserted, but as I remember from last year, on January 6th, the place will be packed. That’s the Festival of the Three Kings. Weather over the past two weeks has been good generally but Christmas Day itself was a dreadful day with eight or so hours of torrential rain. Like many people, by the end of the day I was busy baling out the awning. Fortunately, once the rain stops, the flood water quickly subsides. On Boxing Day not a Bank Holiday here – we took lunch to Maro, and whilst I explored yet another ruined sugar factory one built in 1567, my daughter decided to take the precipitous path down to a beautiful deserted cove. Two days later we set off early and drove inland to Vinuela. From there we took one of the mountain roads which twists and turns for eight miles before reaching Ventas de Zafarraya. Having climbed to nearly 3000ft, the road becomes quite straight and almost level for the next five miles. On either side of the road, the fields are ploughed with most of them producing fine looking vegetables. At the end of this fertile plateau, the road climbs again with more twists and turns, until finally at the top there’s a grand view of the snow-covered slopes of the Sierra Nevada range. 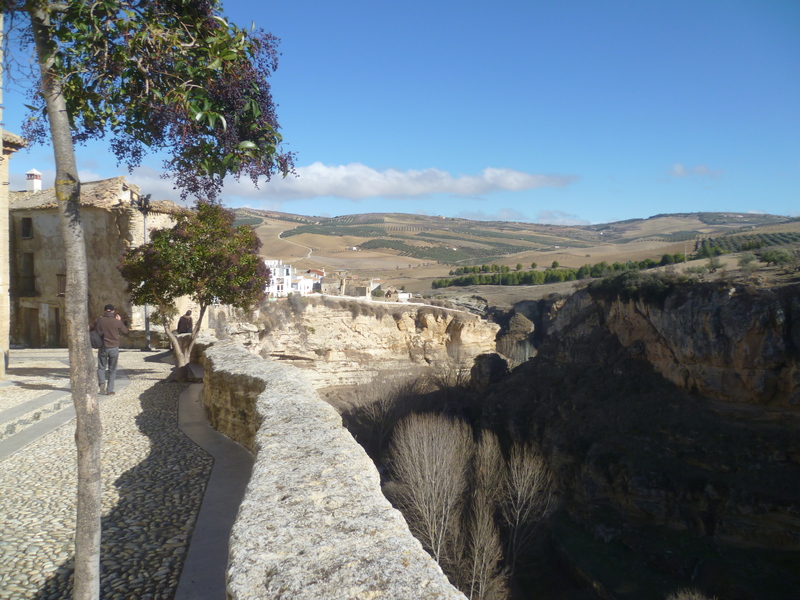 The road then drops down to the town of Alhama de Granada which is precariously perched on the side of a ravine. The old part of the town was built when much of Spain was inhabited by the Moors, but in 1485 they were driven out following a fierce battle with soldiers of the Catholic King. Outside the town the Arab baths can still be seen with heated water spouting from a permanent hot spring. After lunch we journeyed on for another eight miles to enjoy the views at Embalse de Los Bermejales, another man made reservoir. Although a camp site is situated almost on the lakeside, it seemed we had the place to ourselves. This morning we drove to Torremolinos and parked on the beach. We pitched our sunloungers and had an early lunch. All too soon it was time to drive the ten minute journey to the airport to say our farewells. I drove back the 40 miles to El Pino to sit in the awning on my own. But not for long. Very soon my Norwegian neighbour was occupying the second chair wanting to know where I’d been all week. I don’t think there’s anyone who loves the Fancy Dress shop more than your average Spaniard. 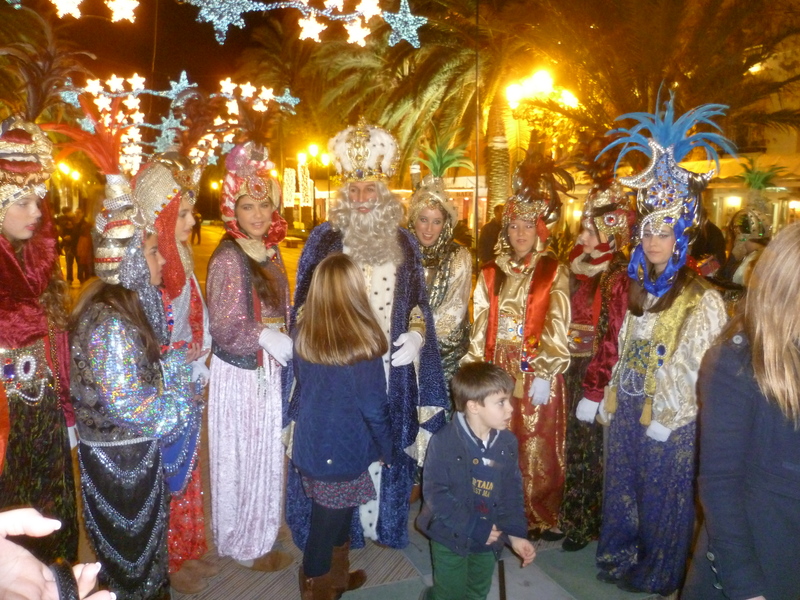 In most months of the year there’s an opportunity to dig into the dressing up box to take part in a fiesta… Here in Nerja one such event was held on the 5th of January, the eve of The Festival of the Three Kings, and the day when traditionally Spanish children get their Christmas presents. Last weekend, having driven to the outskirts of the town, I unloaded my bike and cycled to the area where the procession forms up. It’s made up of several floats pulled by tractors and decked out according to the age range of the group on each float. Between the floats groups of friends gather together and dress according to an agreed theme. Also interspersed between the groups were several local bands, some brass; some woodwind, but all with a heavy presence of drums. With each band doing its own thing, the noise is deafening. 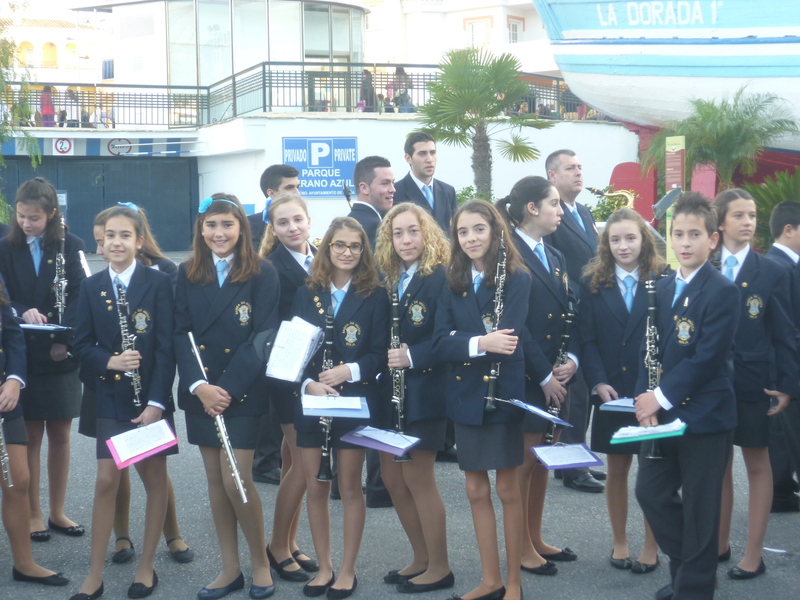 For a town with such a comparatively small ‘native’ population, it was gratifying to see so many young people taking part in the musical activities. 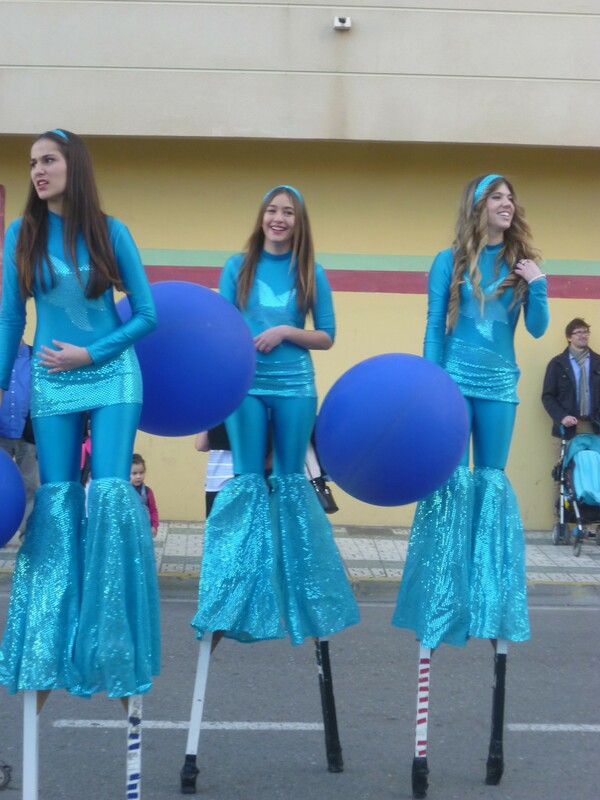 The 5 o’clock start time came and went, but eventually the procession moved off led by a group of girls walking on stilts. As the floats travel around the town, the children on board throw sweets to the watching crowds. Once the procession got under way I returned to my bike and cycled down to the promenade where for twenty minutes or so I sat and watched the sun sink into the horizon, before going to my favourite restaurant for dinner and a San Miguel. An hour later I was ready to cycle again and rejoin the fiesta. For two hours the column slowly moves around the town before finally arriving at a packed Balcon where on a raised platform outside the church, the Three Kings and their retinues process through the crowds, climb the stage and present their gifts to a Mary and a baby Jesus. Later a programme of musical events follows but by then I decided it was time for me to head back along the coast to my caravan. Situated on the approach road to Nerja is the Donkey Sanctuary. No donkey or horse is ever refused, although sadly some are in such poor shape when they arrive that the vet decides they need to be put to sleep. Admission is free although visitors are invited to purchase a bucket of donated food with which to feed some of the animals. Some have been so starved that they are on special diets for a time. 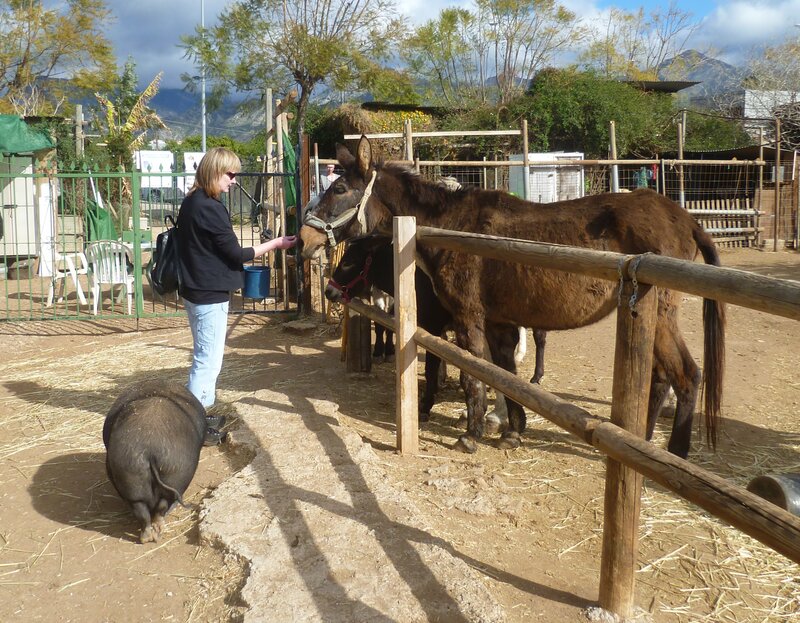 Donkeys and mules are in enclosures; pot-bellied pigs, the sheep and various dogs and cats roam free. Eventually when they have regained reasonable health, a suitable foster home is often found for the donkeys and mules and they go off to spend the rest of their lives in retirement. Sunday. Is it really 14 weeks since I arrived here at Torrox? Today it’s time to take down the awning and start packing. I’m not leaving here until Wednesday but Monday’s weather doesn’t look at all promising – 40% chance of rain and far too much of a risk getting the awning soaked at the last minute. So by 08.30 this morning with waste water emptied and the Aquaroll filled, I made a start on cleaning and moving all the cooking equipment from the awning. The microwave went into the van. The portable electric oven, hotplate and table went into the car. Curtains were next, before removing the four side panels. I’d only just dealt with one panel when friend William turned up to give a hand. We cleaned each section and eventually packed them all into the bag. Next the ground sheet was lifted. From previous experience I’ve found that when it rains for a long period, the ground sheet can become submerged for a time, making it difficult to clean the underside. Now I take the precaution of cutting a length of light-weight polythene from a 2mtr wide roll and fit it under the groundsheet. Usually the groundsheet lifts cleanly and the polythene is binned. So by mid-day, after a strenuous morning, it was time to flop into sun loungers with some well-earned beers. At 6 am the following morning I heard the rain pattering on the van roof so I quietly congratulated myself before going back to sleep.. I’ll miss the awning for the next two days, but it’s great not to have to worry about taking it home damp. Wednesday evening. Today was the day I started my journey back. My planned 8.15 departure got delayed until 9am. Mainly because of gossiping. My pitch has been the one nearest to the site entrance and next door to the shop, so most of those going to collect their hot bread, stopped to wish “Bon Voyage”. My big concern was that I hadn’t seen friend, Mick for a few days. Mick lost his wife just before Christmas following a heart attack and having been in the same predicament myself less than three years ago, we shared common problems. Much to my relief his car appeared just before I left. A short chat and an exchange of phone numbers and it was time to move. Within five minutes, the motorway is reached. Then it’s 18 miles eastward on a comparatively new dual-carriageway. But then the motorway comes to an abrupt end and a very steep, twisting slip road takes the traffic down to join the old coast road. Work on the missing section seems to have almost stopped. Having said that, it must be an expensive undertaking since most of the road is in tunnels; over viaducts or in deep cuttings. Thursday evening. I was ready at 8.15 this morning to join the morning rush hour heading north into Madrid. Three lanes of traffic bowling along without any disruptions. At junction 17 I decided to use the M50. It’s 10 miles longer than the M40 but it carries a lot less traffic. Having reached the A1, the traffic became very light – and also the rain began again. By the time I started the climb towards the summit of Somosierra the temperature had fallen to zero and the rain turned to sleet. The Spanish Highway Authorities are always prepared for bad weather because every slip road had a gritting lorry and a snow plough manned and ready to go. Five miles later I was over the top and heading down wards. My plan was to stop for the night at Burgos but when I reached there at 1.30, the clouds were black and the rain was heavy, so I decided to press on for the last 120 miles down to Santander. Fortunately when I arrived at Virgen del Mar the sun was shining. Now I have 36 hours or so to put in before the sailing on Saturday. Fingers crossed for some good weather. Friday. Oh dear! No rush to get out of bed today. Before it was light I could feel the buffeting of the wind and hear the rain lashing against the side of the van. Immediate thoughts – will the ferry be cancelled at the last minute; will I be able to tow off this wet and soggy pitch. By 11am the rain had stopped so I ventured out. First I drove the ½ mile down to the huge, almost deserted car park situated on the low cliff top. A short distance off the shore is a high rocky island approximately 300 yards long and 400 wide with the small church of Virgen del Mar at its centre. A modern foot bridge joins the island to the mainland. I decided to take a walk. The wind was terrifyingly fierce with the sea boiling around the rocks. Seeing the huge waves crashing against the cliffs, I couldn’t help but wonder if the ferry would arrive. However by evening, a text from a daughter assured me the ship had left Portsmouth and was currently off the French coast. By nightfall there were six outfits on site – all presumably to catch the ferry home tomorrow. Saturday. This morning the wind had dropped but the rain continued to fall. A text message from my daughter told me that the ferry was on schedule. By 11.0am I decided to start preparations for leaving. With electricity and water disconnected, I parked the car with its drive wheels on tarmac and engaged the mover. To my relief the van moved forward through the water-logged grass and reached the towball. Hitched on, I drove the 9 miles to the dock and joined the lines of travellers who were already there. The driving rain kept nearly all the passengers in their vehicles. A leisurely lunch in the caravan followed by a doze and it was almost time to present passports. 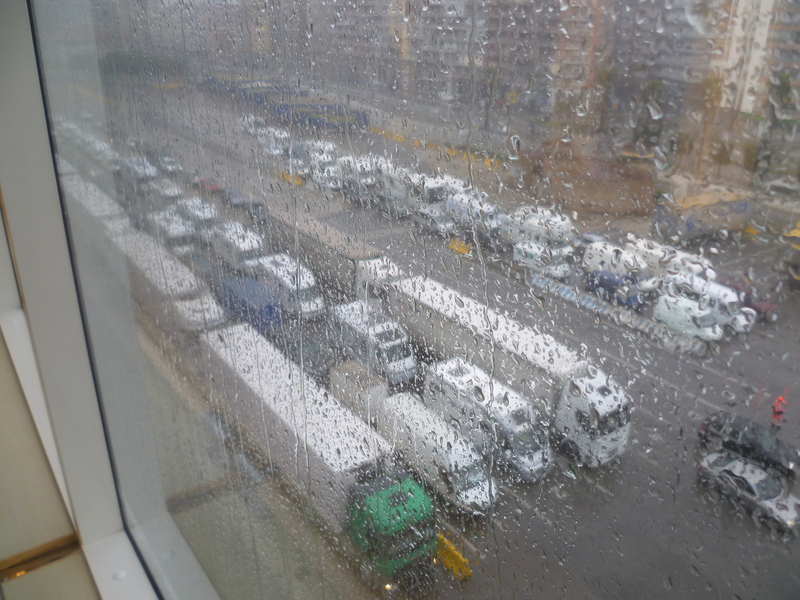 Seeing all the long lines of HGVs, motorvans, cars and caravans waiting to board the Pont Aven, would lead one to think that the ship will be packed. But a quick return to my vehicle just before departure, showed a car deck only half full. I guess it just emphasizes the huge capacity of the vessel. 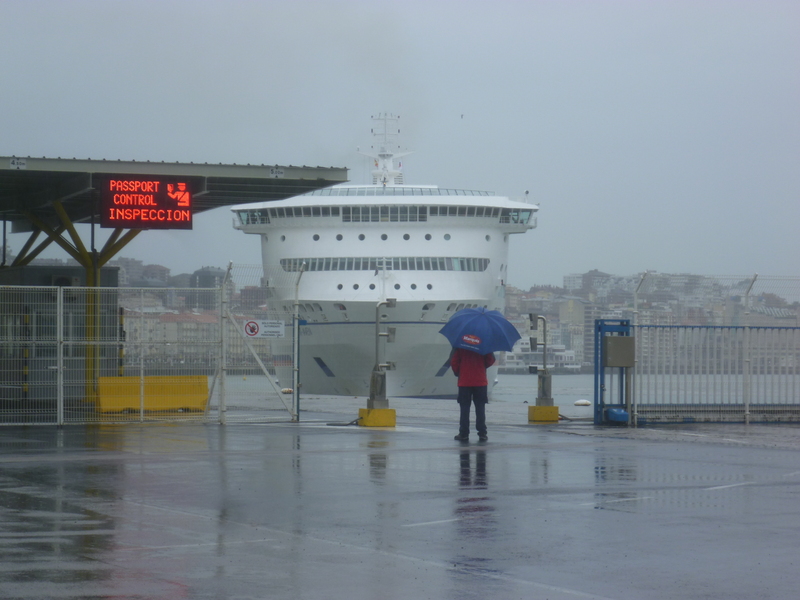 As we left Santander bay the sea was still very rough and the rain lashing down. White crested waves were still crashing along the cliffs. But even with the rough sea, not too much motion was felt on board – until one wanted to walk about. However it didn’t prevent me from having a good night’s sleep. This morning the GPS maps show the position of the ship as having crossed Biscay, rounded Ushant and now entering the English Channel. Maybe we might have an early arrival at Portsmouth. 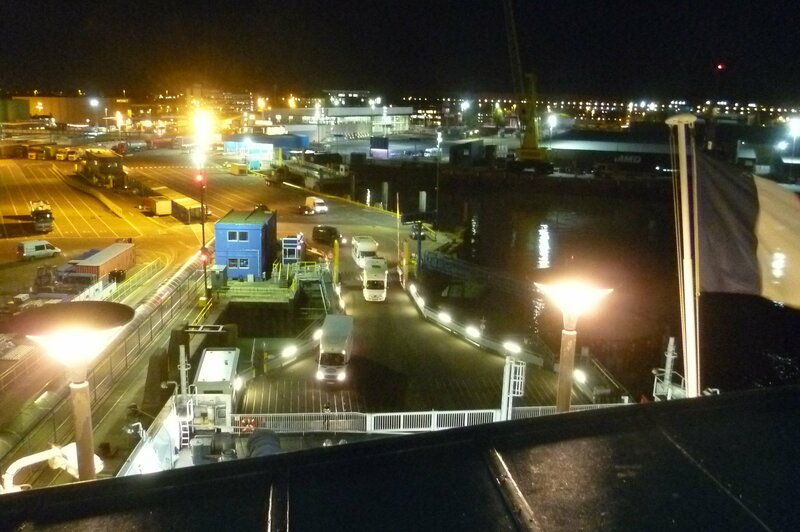 Our hopes for an early arrival at Portsmouth on Sunday evening were dashed when the Captain announced a “short” delay because another ship had still not left his berth In fact instead of arriving at 5.0pm., we didn’t begin unloading until 6.30. Unlike the short sea crossings where passport control is done in France, on the western routes, immigration and customs are carried out at Portsmouth, causing a further delay before getting on with the journey. Although my destination is only 63 miles from Portsmouth, heavy rain made for a slow and unpleasant journey up the A3. Consequently it was turned 9pm before I reached home. With the rain still falling, I left the car and van on the drive. Tomorrow would be time enough to put it away. For the benefit of caravanners who may be contemplating a first long winter stay abroad in the future, here is a list of my main expenses. 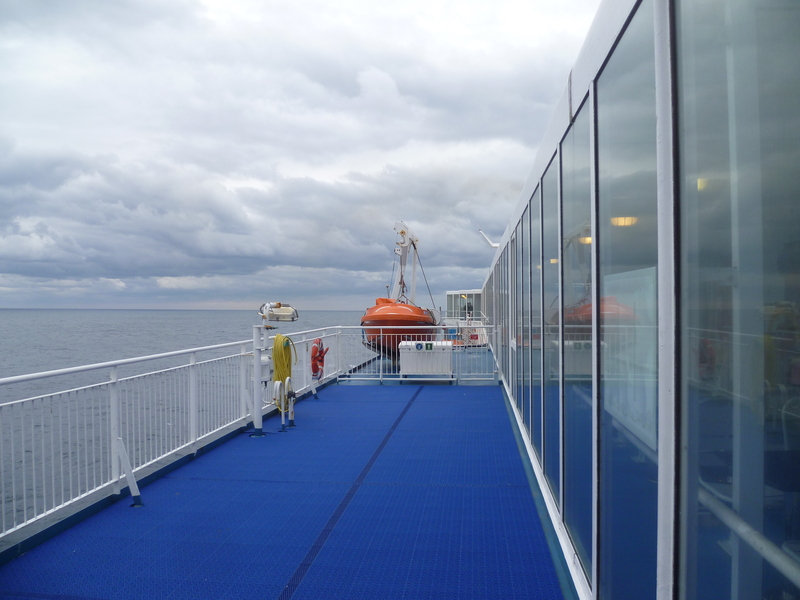 A considerable saving on the ferry fare can be made by using a shorter crossing such as Dover to Calais, but then other costs would need to be added. For instance, the fuel cost would be slightly more than doubled. Extra nights site fees would be incurred and some toll charges would apply for driving through France. Thanks Alan for the kind offer. My mover is a Truma but I’ve made the parts to complete the cross-over and it’s working fine. But thanks again.